Of course, it is not hard to find a better swimming pool around your city. Today majority of hotels provide fascinating swimming pools for their customers. Still, swimming in a natural pools can be a different experience for you. It will make you more connected to the nature, offers you perfect relaxation. Here 10 incredible natural swimming pools around the world. 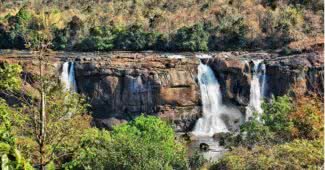 Once you reached the falls, you can see spectacular cascades of water and several pools. Fortunately, a number of pools in this falls are perfect for swimming. For changing the cloths, you can find the wooden huts near the falls. All season are perfect for experiencing the Kuang Si Falls. During the dry season, you can see beautiful turquoise and green colored water. The color is due to the mixing of minerals to the water. During rainy season, you can expect strong currents at Kunag Si falls. So such condition can be inconvenient for swimming. Even though, you can enjoy in the spraying of water. The waterfalls are not the only attraction in the Kuang Si Park. The jungle trekking is another popular tourist activity in this area. On the way to the Kuang Si falls you will also get a close view of traditional village life. Soon, the news spread throughout the Southern Italy. The poets of that time also featured the story of this natural pool within their works. 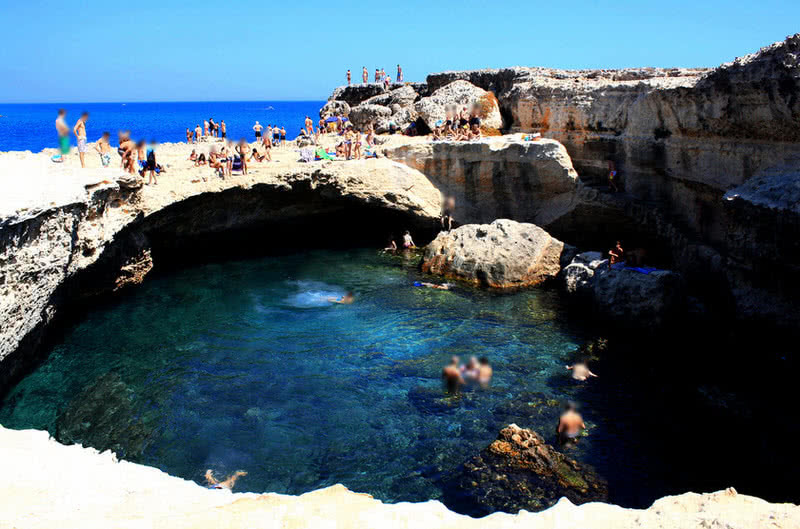 Thus, this natural pool the coast of the Adriatic Sea is named as ‘Cave of poetry’. This 600 square meters natural pool is excavated by years of continuous action of sea. The grotto della poesia pool has a circular pattern. It also have to openings, one at sea side and another at landside. The aqua blue waters of this pools is truly amazing and will offers unique swimming experience for you. 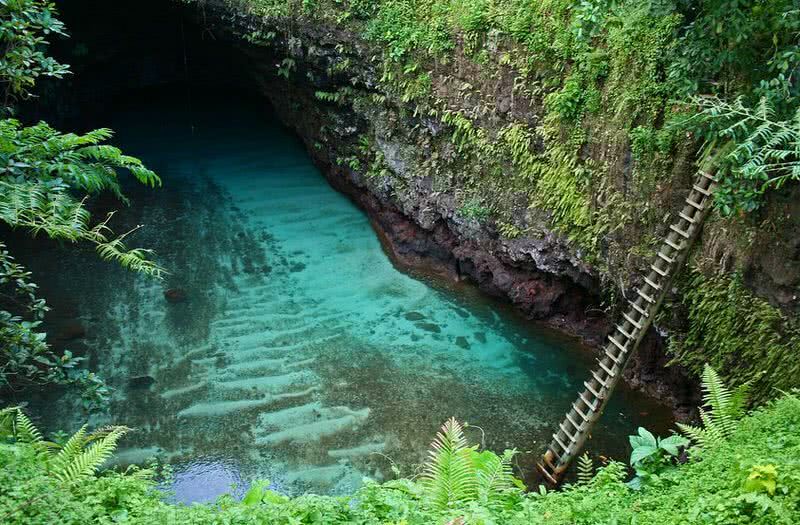 The To Sua Ocean trench is fed by an ocean. The visitors can safely swim in this pool as it is not so deep. There are huts at the top of this pool to relax, eat and drink. This site is also surrounded by beautiful gardens and a scenic beach is very near to it. Unlike the beaches the water of Dudu lagoon is much cooler and clearer. This beautiful natural pool has a depth of 100 feet. There is a small staircase to access the pool. In addition to this facility, you can also find pendulum type ropes there. For a fun filled experience, you can use these ropes to swing and drop down into the cool water of the lagoon. Never think that swimming is the only activity you can enjoy in the beautiful Dudu lagoon. This cenote has underwater caves. So it is also a good place for scuba diving. You can dive into the nearby lake through the caves. It can be a unique and thrilling experience for you. As the name indicates, the Enchanted River is a stunningly colorful river located in the Mindanao Island in Philippines. No one is known about the origin of this beautiful river. 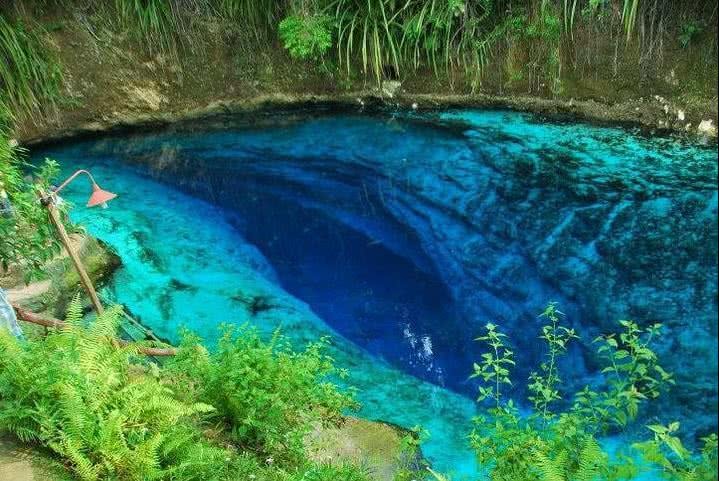 That is why the enchanted river is called so. For first time visitors, the enchanted river look like a surreal place. Because the color of the river is astonishingly beautiful. It ranges from aquamarine to blue. You can see dark blue color in the deep parts of the river. At the same time the shallow parts of the river reflect aquamarine to light blue color. The enchanted river is actually a small, deep river that is very close to the sea. As the water is very clear, you can even see the bottom of the river. The water in the river is also completely free from dirt. All these conditions attracts tourists from around the world to the enchanted river. According to the local people some spots in the enchanted river have the influence of spirits. So that not all areas are allowed for swimming. The night time swimming is also prohibited in this area. Luckily, you can find all facilities near the enchanted river, including cottages, life jackets and delicious seafood. 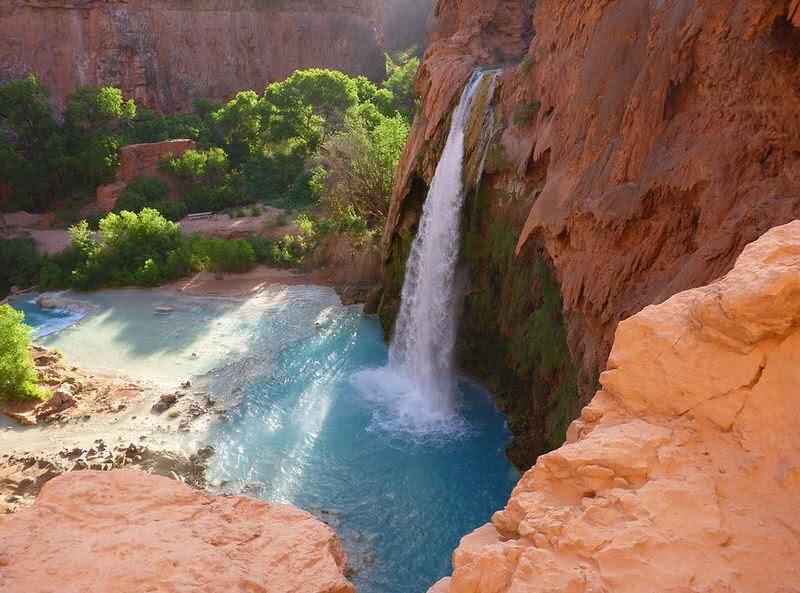 Among the hikers, Havasu Falls are their favorite destination within the Grand Canyon. The brilliant coloration of water and perfect natural pools in a stunning red rock surrounding make it a surreal attraction. The vibrant blue-green coloration of water is due to the high concentration of calcium carbonate. Luckily, the temperature variation for water of Havasu falls is minimal. Throughout the year it offers a pleasant temperature between 21 and 25 degree Celsius. Hamilton pool was formed over thousands of years ago, when the continuous natural erosion collapsed the dome of an underground river. Fortunately, this unique natural pool never gets dried up. It is truly a wonder of Austin City. An unforgettable swimming experience is guaranteed for the visitors. The entry to the Hamilton pool is completely free. 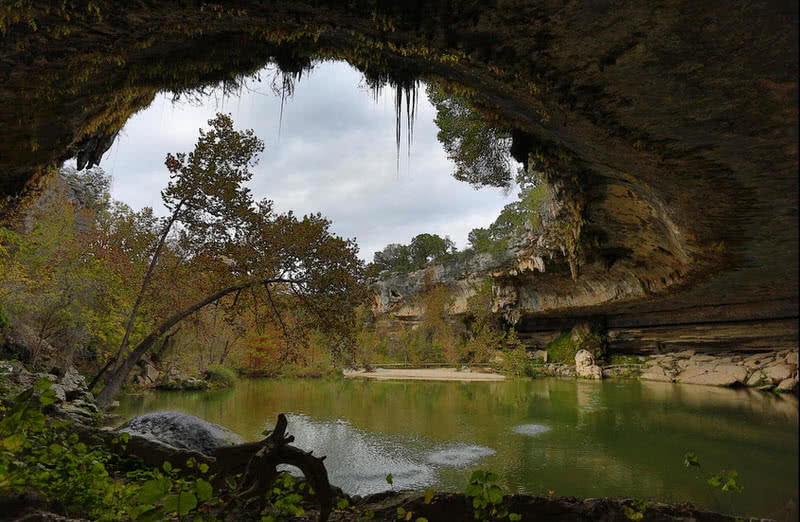 There are so much to see in the nature preserve apart from the Hamilton pool. You can see some rarest birds and plants in the protected area around the pool. But biking and fishing are not allowed in this area. The unique castle like shape of Pamukkale was formed by continuous deposition of minerals by the hot springs over the years. This 1.7 mile long natural site contains 17 hot springs in total. 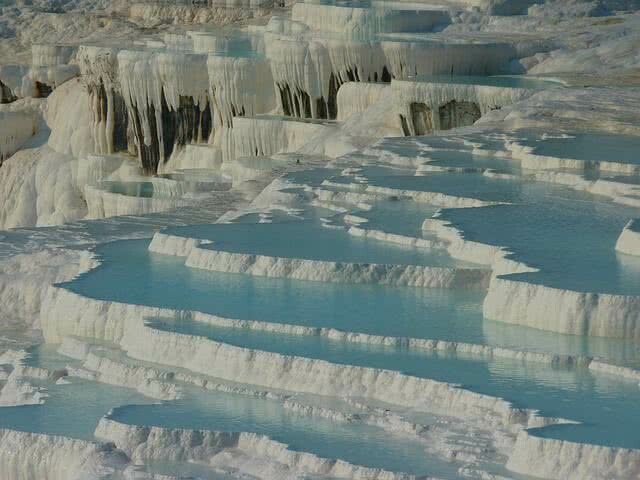 The limestone-terraces of Pamukkale get collected with thermal waters from the hot springs. The mineral rich waters of Pamukkale pools also have the power to cure several skin diseases. At a water flow rate of 500 million liter per minute and a width of almost 1 mile, the Victoria Falls is one of the largest waterfalls in the world. It also has twice the height of Niagara Falls. How about swimming at the edge of such an enormous waterfall? Thankfully, there is a natural rock pool at the edge of the Victoria Falls called ‘Devil’s pool’ on the Zambia side. There are experienced guides to show you the exact spot of Devil’s pool. 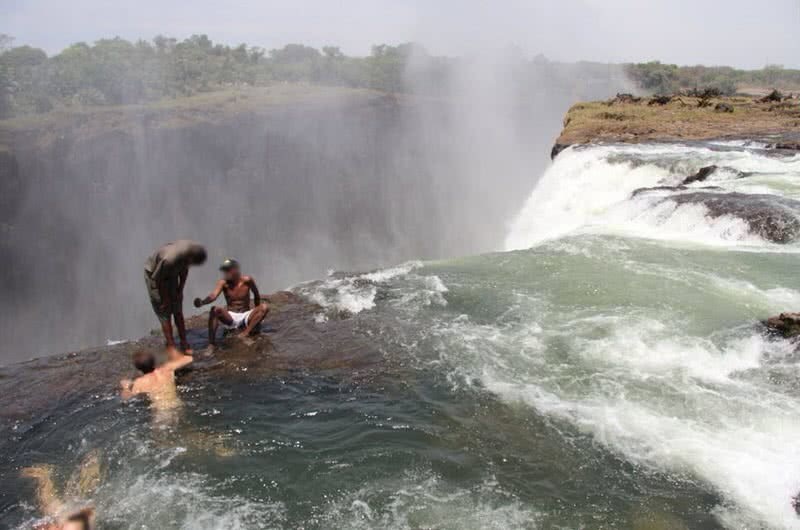 You have to take a boat the Zambezi River to reach the Devil’s pool. At one time, no more than 16 people are allowed to swim in the Devil’s pool. You can sit at the edge of Victoria Falls. The view from the top of the Victoria waterfalls will definitely leave you breathless. In fact, from no other place can enjoy such can incredible view of Victoria Falls. Remember, the swimming in the Devil’s pool can only enjoy during the dry season. In rainy season, the water level will rise. So any attempt to swim in the Devil’s pool in such a condition can be too dangerous. The Ik Kil cenote has a great importance in the Mayan civilization. 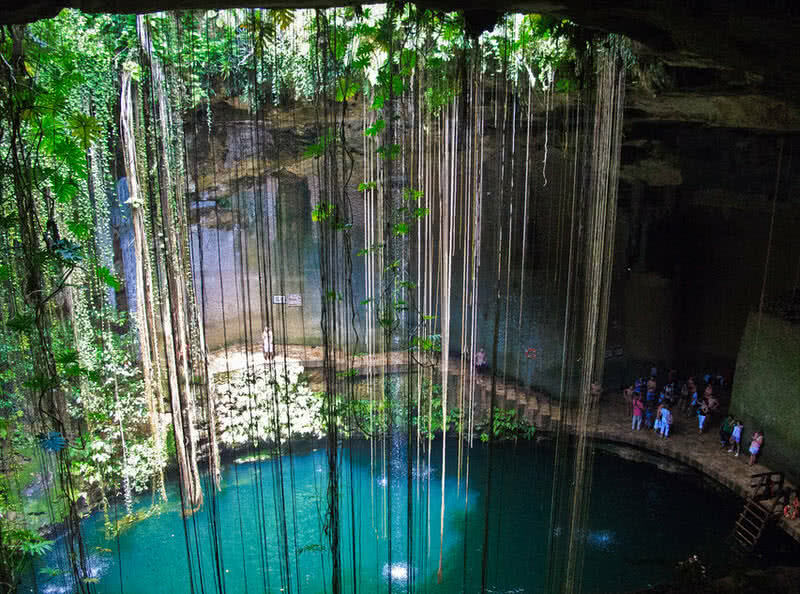 Centuries ago, they have been used this cenote for relaxation and ritual services. Today, it is one of most popular natural pools around the world. The popular Chichen Itza archeological site is also very close to the Ik Kil cenote. The Ik kil cenote was formed by the collapsing of a cave. This 60 meters wide cenote has a depth of 35 meters. The water of Ik Kil cenote is 56 meters below the ground level. There is a ladder carved into the limestone wall of the cenote to access the pool. 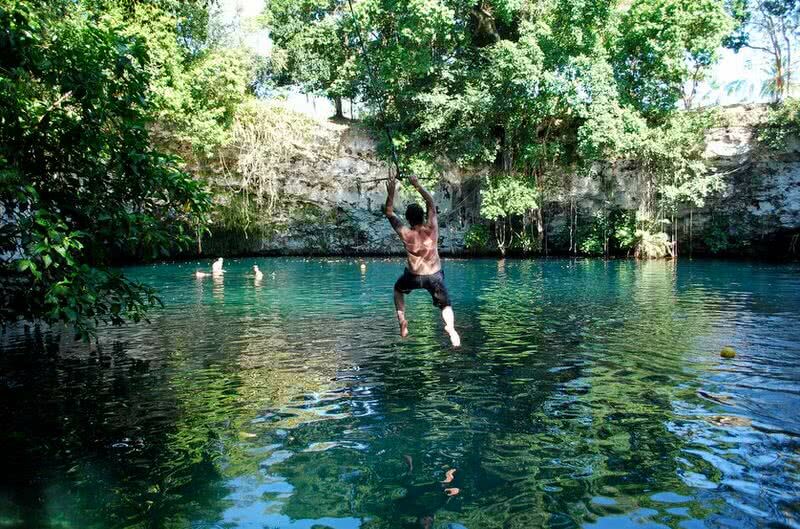 Undoubtedly, Ik Kil cenote is a great place for swimming and diving. The cool, clear water of this cenote offers you a much relaxing experience.